Hot stuff: New testing on a fragment of King Tut's mummy reveals his remains caught fire after being entombed in his sarcophagus.Courtesy Jon BodsworthWe've documented the travails leading to the demise of young King Tut many times here on Science Buzz. But headlines today just add more fuel to the King Tut woe fire (so to speak). Tests done on a small fragment of Tut's mummy that is held in Great Britain show that his mummy caught fire. And that fire, researchers believe, occurred after Tut was mummified and entombed in his sarcophagus through spontaneous combustion from the mixture of embalming oils, wrapping fabric and oxygen. A virtual autopsy done as part of this research also concludes that Tut died from being run over by a chariot. All in all, not a very good day of news for young King Tut. Archaeology doesn't always mean digging in the dirt. Read how satellite images have uncovered 17 buried pyramids near Saqqara, Egypt. And the researchers think there's even more stuff hidden under that site. Here's an interesting travel story about how tourism in Egypt right now is a buyer's market. Even as the King Tut exhibit continues its run here at the Science Museum of Minnesota, headlines around the world continue to keep Egyptology at the forefront of people's attention, particularly in light of the recent political turmoil in Egypt. Here's an interesting story of recent lost and found about one of the trumpets found in Tutankhamun's burial chamber. And the head of Egyptian archaeology efforts, Zahi Hawass, finds himself entangled with post-revolution fallout with his connections to former deposed president Hosni Mubarak and other controversies. Here are a couple reports from the Washington Post and CNN. And here's an interesting slideshow of Hawass doing the various aspects of his job. Half the chicken she used to be: Checking with a scale today, we've discovered Nefertweety has lost about half of her body weight through the mummification process, going down to 1.75 pounds from her starting weight of 3.5 pounds.Courtesy Mark RyanSummer is coming. Do you need help fitting into that swimsuit or other short, summer clothes? Then try the chicken mummy weight loss program. Call 1-800-CHICKEN-MUMMY and for the low, low price of $19.95 you can learn the ancient secrets of how to lose half of your body weight in just 33 days!!!!! Okay, we’re really not encouraging anyone to wrap their body in natron (that combination of salts used inside and outside of organisms you want to mummify) for a month to loss major amounts of weight in one month’s time. But that’s exactly what has happened to Nefertweety, the chicken we are mummifying here at the Science Museum of Minnesota. With this week's check of the bird, we brought a scale to measure the impact of what a month's worth of mummification work has done to the bird. 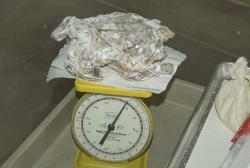 The 3.5-pound fresh, store-bought chicken we had at the start of the process has now reduced down to 1.75 pounds. And she appears to be flattening out even more. We’re going to give Nefertweety another week to finally work through her final mummification issues and hopefully have a fully mummified bird next Tuesday. You can learn more about this whole project by following this link to our Making a Minnesota Mummy section of the Buzz, including how to mummify your own chicken at home. 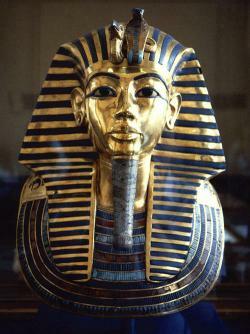 The King Tut exhibit is now open at the Science Museum of Minnesota. I've had the chance to go through it twice already, and one of the hot questions is how did they recreate Tut's mummy, which is one of the final pieces of the exhibit. Check out this video by Materialise, a 3-D software company that was part of the reproduction process. The video shows the combination of software and laser stereolithography technology to make a mummy replica. The video references a recent Tut exhibit in New York City. The same recreated mummy is now on display at SMM. The political turmoil in Egypt this past weekend spilled into the famous Egyptian Museum with reports that some ancient artifacts being damaged or stolen. But concerned citizens helped to secure the building and Army troops are now on the scene protecting the site. Here's a good report on the situation from NBC News. Science Buzz has been a spot of ongoing debates about the return of ancient artifacts to their home countries. I don't know if New York's Metropolitan Museum of Art has followed the discussion here, but it announced it will return 19 small artifacts from its collections that had been originally found in the tomb of King Tut. 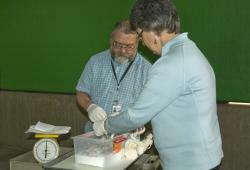 Egypt archaeology officials will receive the items in 2011 after they are displayed for a short time here in the U.S. This link to Zahi Hawass's website includes photos of some of the items to be returned. Here's an interesting piece on King Tut's chariot making its first appearance in the U.S. Be sure to read into the second page to learn about the interesting problem it encountered at customs. Just in case the carnival freak show hasn't made it around to your town yet this summer, here's a little bit of a sideshow for you, the two-headed Egyptian calf.